This graph displays the volumes of Internet applications received by Super Brokers in each month for all years combined. The busiest months for mortgages occur during our second quarter (represented by the green bars) with 29.22% while our slowest is the fourth quarter (represented by the red bars) with 15.80%. The information listed below plots the busy days for mortgage inquiries that were received by the Super Brokers web site. A combined total of all occurrences of each day are represented for the past 5 years. In Newfoundland and Labrador, the day with the most volume, generating 18.99% of all submissions, is Tuesday. In comparison, Friday's are the slowest day with only 10.89% of all inquiries. In Newfoundland and Labrador, mortgage applications are received 24 hours a day from our web site. The report shown below indicates the peak hours over a 24-hour period. The data is taken from all days of all years. The following depicts the average income of applicants living in Newfoundland and Labrador who have submitted a mortgage inquiry using the pre-approval application on the Mortgage Super Brokers' web site. Note: Commercial Mortgage loans were not included for this survey, only home loans were used. 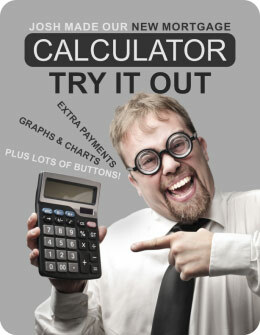 We don't like to boast, but we think the our new mortgage calculator is amazing. It can automatically generate charts and graphs that correspond with the rates, terms and amortizations that you enter, while letting you compare two different mortgages side-by-side. And if you're feeling feisty, you can even add in lump sum payments and see how they affect your mortgage.